This is the second in a series I have been doing on the ABC’s of behavior and training. Click HERE for a link to catch yourself up on the first bog. By the end of the series, we will have gotten to the heart of the matter: consequences. However, we will start at the beginning with antecedents. In the same 2009 article I referenced in the first blog of this series, Dr. Susan Friedman said the following: “Antecedents are the signposts that signal the behavior-consequence.” I often see clients focusing on antecedents instead of consequences, so I suppose it is a good thing that it comes first in the series. The antecedent people are most familiar with is the one taught in classes — a verbal or hand “cue.” This is sometimes still called a “command.” I say “cue” — not “command.” The use of command comes from the military history of dog training and holds an implied threat – do it or else. A cue is a stage direction: now is when you should do that particular thing, i.e. sit or speak or lay down. It also rings more true to the real meaning of the antecedent: the thing that comes before, or as Friedman said, a sign. 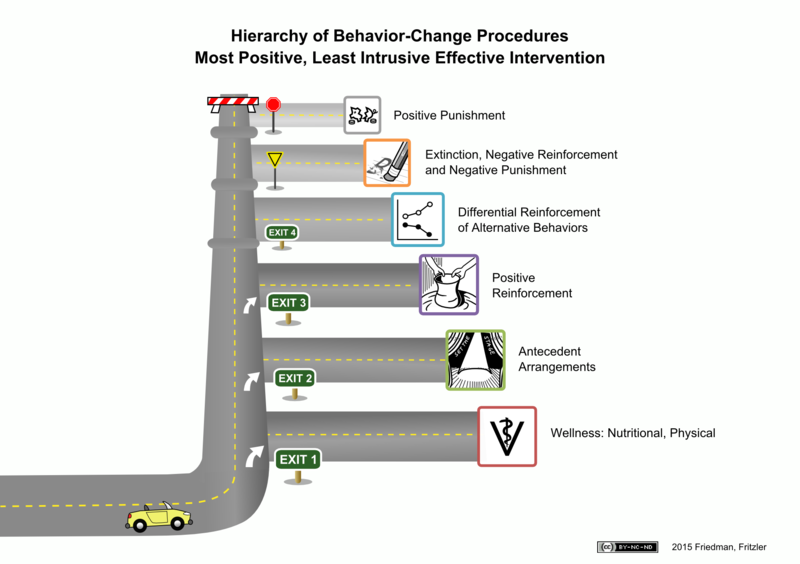 Dr. Susan Friedman also has something called a “Hierarchy of Behavior Change Procedures” (see illustration). It is designed to help trainers make choices about behavior modification plans, and aids trainers in the self imposed “first do not harm” philosophy. As you can see from the illustration, “Exit One” is to look into any physical wellness and health issues the pet may be having that would prevent otherwise open learning, or even the physical ability to perform the task. “Exit Two” is “Antecedent Arrangements,” so if your dog is of sound mental and physical health, the next step is to look into antecedent arrangement or other antecedent issues. A few changes at this “Exit” and you may not even need a huge training plan. Notice this comes before any talk of reinforcement types or schedules. While it may be the antecedent people are most familiar with, a verbal or hand cue to do something is not the only antecedent to talk about. There are other ways behavior gets prompted. We have three examples running through this series, let’s look at some environmental antecedents in those examples. Chewing is a puppy behavior that can drive people batty. So if chewing is the behavior, what is the antecedent? Well, one could make a case that being a puppy is the distant antecedent for chewing. So if the very fact of existing as a puppy is the antecedent for chewing, then how you can arrange the immediate environmental antecedents to set the pup up for success is the question. Have plenty of legal chewing outlets available — chew toys of all varieties — AND pick up things you don’t want chewed. Puppies make you a good housekeeper! So pick up your shoes and put down a chew toy. Exit one. You have set the stage for the pup’s success. In our other example of teaching the discrete behavior of a hand target, the behavior is dog nose to your hand. The elicitor (antecedent) of this behavior is the presentation of your extended hand. When you extend your hand the first time, you can try to enhance its general appeal by rubbing a treat on it, and you can place your hand close to their nose, thus arranging things and setting a scene in which nose to hand is highly likely. I was recently working with a young shepherd on hand targeting. He was not sure what I wanted and began offering other behaviors. So I realized that he needed the whole picture to look different. I tossed a treat away from us on the floor. He ran and got it, turned and ran right back, and just as he was about to run into me, I offered my hand. He, of course, pressed his nose right into it. Presto, mark and toss treat. Within a few clicks, I was standing and offering my hand like before. I just needed to rearrange my antecedent presentation — that’s all. In our more complex greeting of guests in the home, there are multiple behaviors one might be looking at, but to start at the very beginning, the origin antecedent, as it were, is likely the doorbell or knock — or even the sound of the car in the driveway. You have to ask your dog in order to know for sure, so pay attention to when the behavior actually starts and ask what happened right before, because that is the predictive antecedent. If it is in fact the doorbell, you have a trainer’s choice to make. You can work on changing the response to the cue of the doorbell by counter conditioning it, or you can put a note over your doorbell that tells people to text or call to announce their arrival, thus allowing you to work on your door behavior without the very charged beginning cue of the actual doorbell. This also allows you to work on your retraining of the doorbell separately, without rehearsal of the behavior you don’t want to see anymore. So until next time, see how much change you can affect in your dog’s behavior by changing some antecedents. Work on setting the stage with the correct stage directions in place. Coming next month…. B is for Behavior.